If you’re searching for professional and dependable landscape services, look no further than Evergreen Total Landscape. Since 1983, customer experience has been our top priority, and we pride ourselves on creating and maintaining active relationships with all our clients. Customers love us because we actively maintain the properties we work on, performing frequent inspections and check-ups to ensure everything looks great and all equipment is working properly. So whether you need landscape maintenance for a hotel in Tampa, Christmas light decoration for a home in Seminole, or anything in between, consider Evergreen Total Landscape. 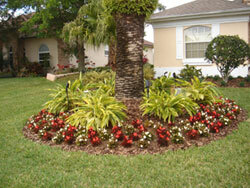 We get the job done right the first time and maintain the land properly for long-lasting beauty. Call or e-mail Evergreen today for more information on our landscape services or to set up an initial consultation and get a quote. We happily serve customers located throughout the Tampa Bay area, including St Petersburg, Clearwater, New Port Richey, Lakeland, and surrounding cities.